What’s Wrong With Four Stories? Christopher Alexander has a thing for four-story buildings (see the Pattern Language). And who wouldn’t agree that it’s a great to maintain a direct connection to the street — connection as in, you could shout up and ask your girlfriend to throw down the keys. But in today’s cities, does it make sense to put such a limit on density? Commenter Steve surmised that this section of Eastlake will never be a vibrant pedestrian district because it draws from too small a residential area. 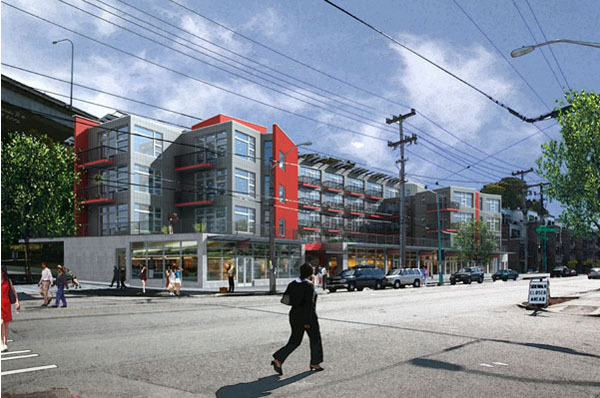 But what if each of these new 4-story residential buildings had two more floors, i.e., 2/3 more units? I don’t get Seattle’s NC-40 zone. 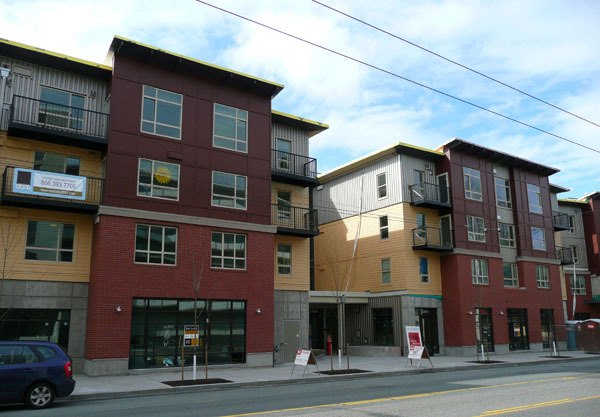 You can’t even build a decent “3-over-1″ mixed-use building in 40 feet because there isn’t enough height for a standard retail space (this is why NC-65 has that extra five feet tacked on). Fortunately, developers routinely get the extra ~ 5 feet they need through an allowance in the code. Even so, it can be a challenge to make a 4-story building pencil when underground parking is desired, and so the developer ends up cutting corners elsewhere in the building, e.g. facade materials and windows. Seattle needs to take another look at its NC-40 zones to identify those that should be upzoned to NC-65. A prime example is 23rd and Union. Of course, there are places where a 40-foot height limit makes sense. But I suspect there are lots of areas where an upzone is warranted. Upzones are always controversial. But if we’re serious about creating a more sustainable city through densification, we’ll have to accept that change is not painless. Posted by dan bertolet on	Wednesday, April 9th, 2008 at 11:08 pm. You can follow any responses to this entry through the RSS 2.0 feed. You can leave a response, or trackback from your own site. Huh. That was a regular bike route just a couple short months ago. Now looky. Rapid change indeed, Dan’l. It’s funny I was having this exact conversation with Ben Schiendelman (another guy at STB) and we came to the same conclusion, but this time about Aurora. BTW, the height is 40′ on aurora also,. 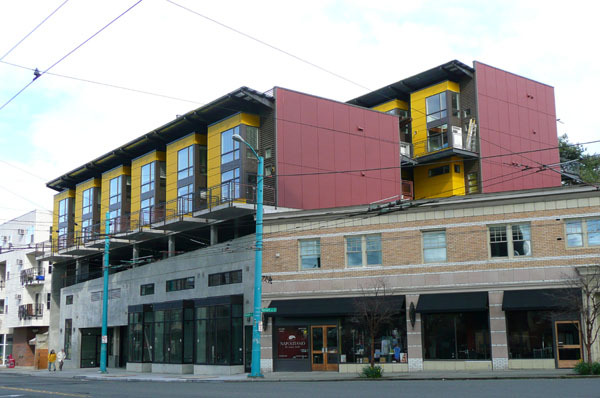 If I recall, Alexander’s argument revolves around the fact that no more than 4 stories is necessary for a vibrant city. In most cases I think he;s right (i.e. Europe). I think you underestimate Eastlake, its on a route from the North End to Downtown and unlifting a bunch of those single family homes could easily double or triple the population in the area. Limiting the height helps maintain some connection with the water for everyone. Aurora and Eastlake seem pretty different to me — Eastlake at least has the potential to be pleasant (e.g. if there were a few more traffic lights, so nobody got going faster than about 30 mph). Aurora will never be a good street to live next to. I think this, rather than the height restriction, is why some of the big developments up in Bitter Lake are happening along Linden rather than along Aurora. All that said, I believe the true distinction between where NC-65 zones exist vs. where NC-40 zones exist is the distinction between a neighborhood that wants development to happen and one that believe everything can stay as it is. None of which is to say 4 story buildings are bad. But I’m with danb — there are a lot of places that could use NC-65 upgrades.